In the past we have been blessed with some extraordinarily pleasant weather, albeit cold, for our traditional Remembrance Day Run. This year apparently a break with tradition was needed and anyway it never rains on my rides. I awoke to a heavy mist and the weather was misty too, a good sign I thought, as I rolled down the drive at 8.15 on my way to Warrs. I had to smile as I joined the M4 to see the FOG warning beacon proudly lit. Up until that point I would completely have missed (no pun intended) the mist! True to form the brave motorists of Slough and environs were happily displaying their shiny new fog lights while switching from the centre to the outside lane in the 2,000 foot visibility. (The inside lane round here is usually kept clear exclusively for cows, elephants and tigers and such like). I stopped briefly at the Royal British Legion in the Kings Road to purchase a wreath. I was told the previous day they were all sold but no, you’re the biker chap that turns up every year for a wreath so there is one reserved for Chelsea & Fulham H.O.G. apparently. Do please let the British Legion know after I die that someone else will be picking up the wreath in future! Arriving at Warr’s I was greeted by a sea of smiling faces, coffee, pain au chocolat and croissants as the hardy gathered. I was also reminded that this is not a ride for our pleasure; it is a ride to commemorate the sacrifice of others who can no longer ride. It is a ride which we make every year irrespective of the weather or the cold, it is the least we can do. We all have our ways of displaying our commitment; from the man that spent half the previous night bulling his boots, the man whose beret was proudly worn, the man who drove through the night to join the ride, to the daughter who gladly joined her father as pillion on the day. Medals were also displayed on more than one chest but in every heart. Briefing complete we set off along the Kings Road and, as always, caught many an eye. After filling Putney High Street with the thunder of our passing, the A3 took us to the leafy back roads beyond the M25. Our ride was without incident and even the horse riders we passed waved happily. We were briefly joined by a group of ‘other’ bikes at Holmbury St Mary, until their slightly distraught leader realised that the group of riders directly behind him were not his fluorescent entourage and hastily pulled over to watch open-mouthed as we sailed past, to be followed by his ride. Our stop for a two minute silence was at The Parrot Inn in Forest Green. The pub has featured in the Michelin Guide for the last 3 years and now sources much of its food from local producers including the Farm that owns the lease. We gathered in the damp car park and waited for the guns from the nearby Gosterwood Estate to cease (their Nokia was a little later than ours apparently). At the conclusion of our silent reflection Michael read the “We will remember them” epitaph and we had a moment of quiet reflection. We stepped inside briefly for some most excellent fresh coffee before mounting up and heading out along the delightful lanes of Surrey to Cranleigh, where the large Remembrance Parade had just finished. Across the A281 and past Top Gear’s Studios at Dunsfold, through the villages and sweeping bends between we rode to pick up the A283 at Chiddingfold. Despite the persistent precipitation (even I have to allow the weather gods one day a year) this was turning into another great Chelsea and Fulham Ride. I rather doubt there would be many battling the elements on such a day to experience roads like these. Our last leg saw us cross the A3 at Milford and wind our way towards Elstead and our destination memorial just past the village green. 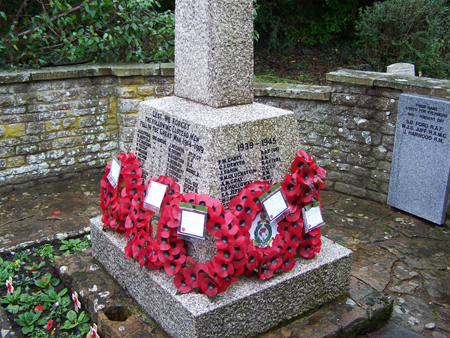 Having parked in the spacious lay-by opposite we crossed to the memorial already bedecked with bright red poppy wreaths. As our most decorated member, Gavin laid the wreath with true military aplomb while Michael gave us a brief reading from “Here Dead We Lie” by AE Housman. I too felt compelled to say a few words in admiration for my fellows who had joined together on this day, not for self but in an act of remembrance for those who gave their all, we salute you. Thanks to John Warr for opening up the shop and providing breakfast, to Nick Deal who joined Michael and I on the recce and rode as Last Man’s Marshal on the day and to the staff at The Mill who provided warm fires, a most excellent luncheon and some rather fine ales to round off the day.